This is a bold, bright blend of Cabernet Sauvignon, Merlot Malbec and Cabernet Franc. The flavors and aromas are red to black fruit, like coastal black berry as opposed to the darker Himalaya berry. There is a touch of pepper and cedar box in the finish. The mouthfeel is smooth and rich balanced by cool-climate acidity, more typical for the northern and mountainous Humboldt County. Ready now, it will only improve over the next 15+ years. This is a right-bank style Bordeaux blend of Merlot, Cabernet Sauvignon and Cabernet Franc. It is dominated by dark red to black fruit notes, like a red raspberry -blackberry mix. It is layered with subtle notes of blackberry bramble, sweet fennel and forest floor. The 2016 Coho Red is downright quaffable when paired with pizza or pasta. Drink now or age for another 10+ years. The 2018 Sauvignon Blanc was picked and co-fermented with 5% Semillon, giving our Sauvignon Blanc a slightly rounder mouthfeel. It has a delicate bouquet of citrus blossom with flavors of lime and smooth icy mint. This is a crisp, non-oaked Sauvignon Blanc more reminiscent white Bordeaux, than a grassy Sauvignon Blanc of Marlborough, New Zealand. 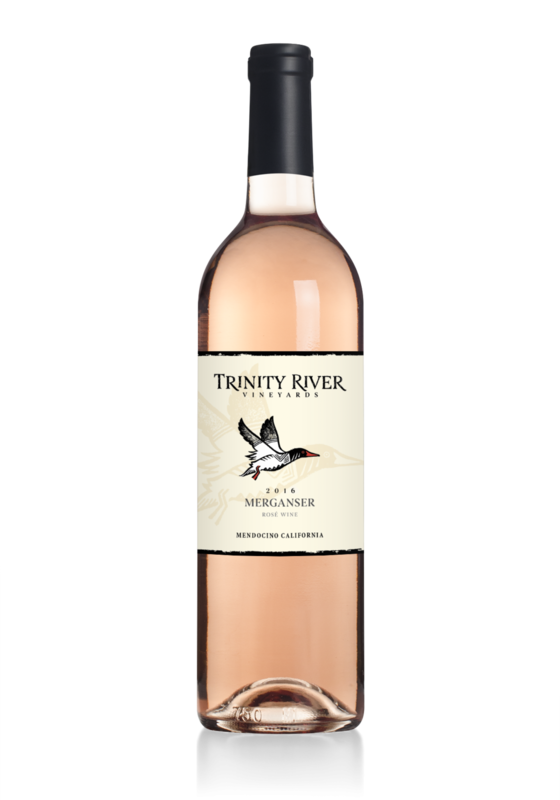 Our 2018 Merganser is a dry Rosé produced from 100% Sangiovese chosen specifically for the Rosé. Picked at just the right sugar and acid combination, this Provençal-style rose is light, luscious and goes down far too easily. With hints of white peach, strawberries and watermelon this refreshing wine is perfect for a spring picnic or summer barbeque. This vintage shows the warmer side of Pinot Noir. The flavors and aromas are dark and brooding, but still light, crisp and smooth compared to Bordeaux wines.There is a touch of spice and baked fruit flavors, but the mouthfeel is smooth and elegant, like one would expect from a classic Pinot Noir. Ready now, it should only improve over the next 10 years. 2018 Osprey Chardonnay has a subtle floral and fruity nose is followed by green apple and melon fruit flavors. This is a crisp non-oaked chardonnay more reminiscent of Burgundy then Napa. 100% Stainless Steel throughout production keeps this wine bright and full of tension. It is ripe, but has great acidity for balance. This white wine is ready now, but has 2-5 years of staying power not typical in fat, over-ripe whites. Our 2018 Riesling comes from the oldest vines on the Nelson Family Ranch also known as the old Crawford Ranch. Only bottled when the perfect conditions occur, this is a truly rare DRY Riesling expressing all that is great about these old vines on this beautiful land. This dry Riesling is full of tropical fruit with a hint of lychee nut and a kiss of sweet diesel-like terpenes. The 2018 Kingfisher Sauvignon Blanc is 100% fermented in stainless steel tanks at very cool temperatures. This helps to lock in aromatics and preserve crispness, making it a lively food wine. Full of citrus and minerality, this Sauvignon Blanc begs for oysters and seafood. This is a cool-climate Syrah, more similar to Cornas or Saint Joseph of France, than to anything in California. The flavors and aromas are dark and brooding as one would expect from Syrah, but brighter and leaner than most California Syrahs. There is a touch of black pepper and baking spices in the finish and the long, lingering mouthfeel is smooth, but pronounced. Ready now, if you are into bold and tannic, it should only improve over the next 15 or more years.